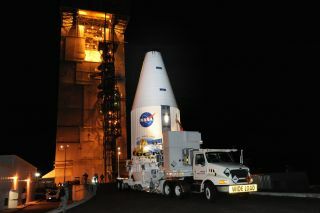 The payload faIring containing the Landsat Data Continuity Mission spacecraft arrives at Vandenberg Air Force Base's Space Launch Complex-3E where it will be hoisted atop a United Launch Alliance Atlas V for launch. Image released Jan 25, 2013. NASA is gearing up for the Monday (Feb. 11) launch of an Earth-observation satellite that will continue a celebrated 40-year project to monitor our planet's surface from space. The Landsat Data Continuity Mission is slated to blast off Monday at 1:02 p.m. EST (1802 GMT/10:02 a.m. PST) from Vandenberg Air Force Base in California. The LDCM satellite is the eighth overall in the Landsat program, which has been scrutinizing Earth from orbit continuously since Landsat 1 launched in 1972. Mission team members call LDCM the most advanced and capable Landsat spacecraft ever built. It should help the United States and other nations around the world monitor environmental change and better manage their natural resources, they say. The $855 million LDCM mission is a collaboration between NASA and the United States Geological Survey, which will take over operations after the spacecraft's launch and initial checkouts. At that point, the satellite will be renamed Landsat 8. Landsat 8 will zip around the Earth at an altitude of 438 miles (705 kilometers), using two sensors to study the planet's surface in the visible and infrared portions of the electromagnetic spectrum. The SUV-size satellite will achieve full Earth coverage every 16 days, though its work will lower this to once per eight days for the program overall. That's because Landsat 8 will fly eight days behind Landsat 7, which launched in 1999 and recently became the only currently operational Landsat spacecraft. (Landsat 5 retired recently after 29 years of service). Landsat 8's observations will have a broad range of applications, from illuminating the impacts of climate change to monitoring agricultural output to helping authorities respond to natural disasters, scientists said. "Landsat data is a global resource, empowering nations to individually monitor and report," said Mike Wulder of the Canadian Forest Service in Victoria, British Columbia. "Further, Landsat data allows us to see what the world looks like, and how it has changed over time." The weather should be good at Vandenberg during Monday's launch window, officials said, but it hasn't been cooperating today. The mission team wanted to perform some ordnance connections on LDCM's launch vehicle, a United Launch Alliance Atlas 5 rocket, earlier today but were unable to do so because of the threat of lightning. "We've got to be able to get that work done," said NASA launch director Omar Baez. "If we don't, then we'll have to reassess the schedule. But it's too early to tell."